Who are the best at doing the little things? Sidney Crosby, Evgeni Malkin and Steven Stamkos are stars because of their offensive skills -- after all, the basic premise of hockey is that you have to put the puck in the net more than the other guy, and they're better at making that happen (for themselves or their teammates) than just about anyone else. But there's more to winning hockey games than just scoring goals, and not even those aforementioned superstars can do everything. Doing the dirty work and excelling at the little things play a big role in winning games as well. The numbers say Colorado's Ryan O'Reilly was the NHL leader in takeaways last season with 101, just ahead of runner-up John Tavares of the Islanders (99). But just about any survey of players and coaches will tell you that Detroit's Pavel Datsyuk is still the NHL's top puck thief. Datsyuk finished third in the League last season with 97 takeaways -- but he got them in just 70 games, missing the other 12 due to injuries. Of the six players who had 90 or more takeaways last season, Datsyuk was the only one to play fewer than 78 games. Prior to 2010-11, when he had 71 takeaways but was limited to 56 games, Datsyuk had led the NHL in takeaways in three of the previous four seasons, including 2009-10, when he had 132 -- 49 more than runner-up Ryan Kesler of Vancouver. In 2008-09, the one season he didn't win, Datsyuk's 84 takeaways were second to Malkin, who had 89. 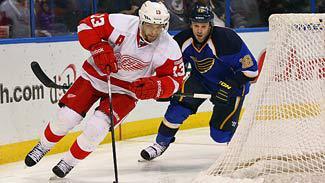 Datsyuk's total of 144 in 2007-08 is the most since takeaways became an official stat in 2005. While the offensive guys battle for scoring glory, Minnesota's Cal Clutterbuck and L.A.'s Dustin Brown spent years waging their own battle to be No. 1 in hits -- until Martin blew them out of the water in 2011-12. Clutterbuck had banged his way to the top of the NHL's hit parade since entering the League as a rookie with the Wild in 2008, leading all players in hits in each of his first three NHL seasons -- Clutterbuck's 356 hits as a rookie in 2008-09 were the most ever by any player. The operative word here is "were," because Martin, a fifth-round pick by the Islanders playing his second full NHL season, battered his way past Clutterbuck's mark when he was credited with 374 hits. That was 81 more than Brown, whose 293 hits were five more than Clutterbuck last season. No one has been credited with more hits since they became an official stat in 2005-06 than Brown, the captain of the Los Angeles Kings. Since 2006-07, he's been in the top three each season, leading the League in 2007-08 with 311 -- a number that's even more impressive when you consider he also put up 33 goals. Brown had 22 goals (and 54 points) to go along with his 293 hits in 2011-12, and has scored 20 or more goals in five straight seasons. Martin took 121 penalty minutes -- a low total when you consider his hit count and the opponents he must have annoyed, and a drop from 147 in 2010-11. But it's still a lot compared to Brown, who had 53 and has averaged fewer than 60 PIM in his seven NHL seasons, and Clutterbuck, whose 103 penalty minutes marked the first time he'd broken 80 in a season. Not surprisingly, no player has repeated as the leader in this category since the NHL started listing real-time stats in 2005 -- after all, the blocked shots of today are the bruises of tomorrow, and standing up to slap shots time and again is no fun. No one took one for the team more often last season than Gorges, who blocked 250 shots in 82 games -- more than three per game. No other player blocked more than 200, though Tampa Bay's Brett Clark was close with 199. New York Rangers defenseman Dan Girardi was fifth with 185 and leads all players in blocks during the past three seasons with 601 -- he's the only player with more than 600 blocks during that span. If there were an "Ouch" trophy given out, Girardi would have earned it last season -- not only did he block 185 shots while playing all 82 of his team's games, he was credited with 211 hits. The leader since blocked shots became a recognized statistic in 2005-06 is Anton Volchenkov, who played five seasons with Ottawa before signing with New Jersey in 2010. He's blocked 1,282 in seven seasons -- but got in front of just 106 and 125 in his two seasons with the Devils while missing 35 games with injuries. Volchenkov set the single-season mark of 273 with the Senators in 2006-07. It's a lot easier to score when your team has the puck, and the best way to make sure you have it more often is to win a lot of faceoffs. It's no accident that successful teams like Boston, Vancouver, Detroit and San Jose are near the top in faceoff percentage on a steady basis. Toews was the leader in winning percentage on draws last season, winning 59.4 percent of the 1,137 faceoffs he took for the Chicago Blackhawks. But you could make a case that Boston's Bergeron was more valuable; he won 59.3 percent while taking 1,641 faceoffs -- 504 more than Toews, who missed 23 games with injuries. Bergeron also took 240 of his faceoffs while the Bruins were shorthanded, more than twice as many as Toews, and was remarkably consistent -- he was third at home at 61.7 percent (Toews was second) and No. 2 on the road at 56.8 percent (Toews was seventh). Bergeron also led all players with 973 wins in the circle. Bergeron's faceoff prowess, combined with his other defensive skills, helped him win the Selke Trophy as the NHL's best defensive forward.